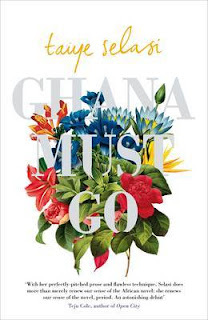 Celestine Nudanu from Ghana is the winner of my 5th Anniversary Book Giveaway. Ghana Must Go by Taiye Selasie has been dispatched to her. She is a blogger on Reading Pleasure and author of Haiku Rhapsodies. She was part of my Blogger Spotlight Project. Please click here to read her interview. The Book she'd recommend me to read is Home Going by Yaa Gyasi, she says it is a highly riveting read. I can't wait to read it. Her favourite review on my blog is One is enough by Flora Nwapa because the review raised so many issues that are pertinent even today. Future giveaways on my blog will include The Lowland by Jhumpa Lahiri and The Fishermen by Chigozie Obioma, if you'd like to win a copy of these books, please continue to visit Mary Okeke Reviews, leave your comments, follow on twitter @MaryOkekereview like on Facebook at Mary Okeke Reviews. Ow Mary, I'm so tickled to be the winner of your 5th Anniversary Book Giveaway. I've so much wanted to read Taiye Selassie's book. Can't wait to feel it in my hands. Thanks to you for participating. Hopefully, in a couple of weeks you'll get it.